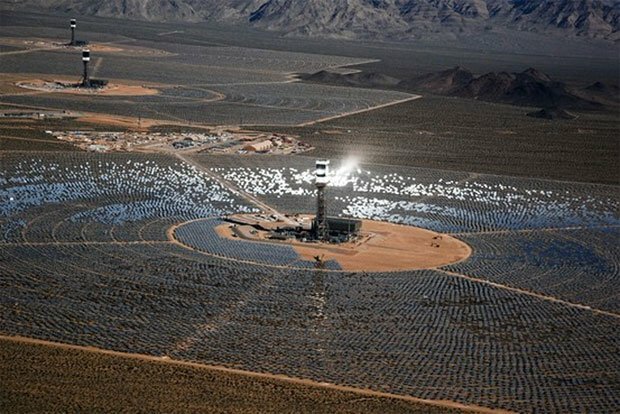 Last week in the California desert, a $2.2 billion solar plant opened that creates electricity by harnessing solar energy. Rather than using traditional solar panels, this facility has hundreds of mirror-like reflectors that shoot the sunlight at a tower filled with water in the center of the mirror arrays. That water inside the tower is turned into superheated steam by the 1000°F temperatures to turn a steam generator, making electricity. Researchers working on the project said that they expected the heat could result in some dead birds. What they didn’t expect was how many birds would be killed by the massive solar death ray. Unfortunately, dozens of birds with singed and charred feathers have already been recovered at the site. The birds don’t even have to land on the tower; simply flying through the solar beam will kill them. Researchers are currently conducting a study to determine how to reduce the threat to local avian populations. Until the research is complete, Big Bird should maintain his distance.